Tall Girl In Heels : Dancing in The Sheets!! 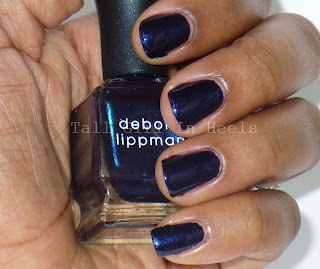 Deborah Lippmann polishes are just great. I've been hearing so much about them so since I reviewed Dream a Little Dream of Me, I been wanting another one. I ordered 2 and this is the first one I'll be reviewing, Dancing In The Sheets. I loved this color when I saw it. It is a dark purple with blue and purple shimmer throughout. 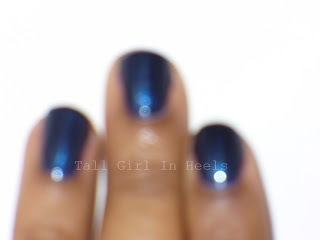 Sometimes this polish can look like a navy blue which is because it is a duochrome. I absolutely love it! Application was flawless! I had no problems at all! I just want to look at my nails all day! They are Gorg!!! Once it hits the sun I fell in love all over again. Ah! My hubby says it looks like a metallic purply-blue :-). Check out this picture below. You can see the duochrome in the bottle and it translates onto the nail. Dancing In The Sheets was paired with Let's Hear it For The Boy and made for HSN. They are apart of the Footloose Collection and retails, right now on clearance, for $16! When I saw the price I jumped all over it. I'll definitely be getting more of these polishes. I can say I like how her polishes apply perfectly and dry with a shine. You can purchase this polish right now on HSN. In the pictures below I use two coats and I top coat, but I could have easily gotten away with one coat. What do you think of this polish? Do you have it? 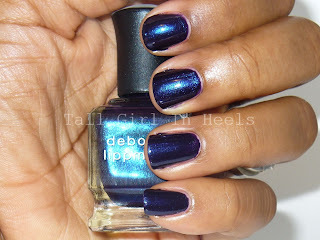 Share your favorite polish from Deborah Lippmann so I can determine what my next purchase will be. If you can catch her when she is actually live on HSN she usually has a couple of deals only for that hour and you need to be quick because they sell out but so worth it. Last time she had 2 full size polishes and a topcoat for $35. Nice! What's your favorite DL polish?